Every fantasy football league worth its salt rewards the best teams with some sort of tangible prize. Although there are more fantasy football prize ideas than ever before, the fantasy football trophy is still a staple in many leagues. And for good reason. In this review of the best fantasy football trophies, I break down the most spectacular perpetual and single-year trophies for the 2018 NFL season. If you're looking for a stunning, unique, or cheap fantasy football championship trophy to award your league champion this year, you've come to the right place. Here is a comparison of the best trophies for the 2018 fantasy football season. You can click on any of the product links below to check current prices, or click a Read Review link to jump to my detailed trophy review below. How much does a fantasy football trophy cost? Where can I buy a fantasy football trophy? What do you put on a fantasy football trophy plate? The trophies in this review are targeted toward your league champions. Check out my other article on funniest fantasy football trophies if you want to present ridiculous trophies to the bottom-dwellers of your league. Compared to some of the more unconventional fantasy prizes out there (think fantasy football championship belts), trophies usually cost considerably less. Cheap fantasy football trophies, especially single-year trophies, are frequently sold for under $30. Even for fantasy leagues on a tight budget, cool fantasy football trophies are still within reach if you operate stable leagues that span multiple years. The key to buying an awesome, perpetual fantasy football trophy is to spread the cost across all league owners and multiple years. Even the most expensive trophies on the market have a low cost per owner-year if you operate a long-running league. Consider a $400 perpetual trophy (none of the trophies in this review are that expensive). Spreading a $400 trophy across a league of 10 owners, over 4 years, the cost per owner (each year) is a mere $10. If you're looking to buy a fantasy trophy from a proven vendor in the online fantasy sports space, you should check out Fantasy Jocks. They have two trophies in this article, and I reviewed Fantasy Jocks in detail here. Undisputed Belts also has a decent trophy selection in addition to their line of belts. You also can't go wrong searching for fantasy football trophies on Amazon. Amazon has a never-ending selection to choose from and trophies to fit any budget. Fantasy football trophies are undoubtedly the most popular prize in many leagues. But if you're looking for something more unconventional for your league, consider a fantasy football championship ring. Although championship rings are typically a yearly expense, they're a slick alternative to your typical fantasy trophy. If you commit to spending your league's hard-earned money for a fantasy trophy, you need to ensure you're getting a quality product. Excellent customer service is quite essential because trophies can and do get damaged during shipping. I did most of the work for you in this regard as all of the trophies in this review have a well-documented, satisfied customer base. But don't take my word for it! Click through to any of these trophies and read for yourself what customers have to say. Every trophy in this review has testimonials or a customer review section where you can review the feedback. Fantasy championship trophies generally come in two varieties: single-year or perpetual (multi-year). The best trophy type for your league will depend on the preferences of your owners and your league budget. Do your fantasy leagues usually last for one or multiple years? Do you want to your owners to be able to keep their trophy each year? Does your league have the budget for a low-cost or a high-end trophy? 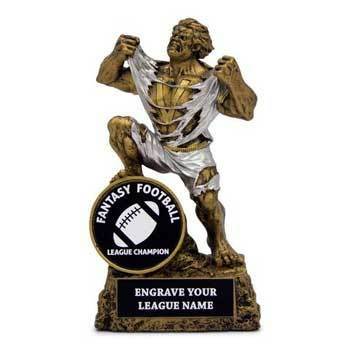 Are you looking for a fantasy football trophy with nameplates? I'll address how the answers to these questions should affect your buying decision in the following sections. Our Free Draft Prep Tool: Create your 2018 fantasy player rankings on a custom fantasy football cheat sheet. Perpetual trophies are passed from owner to owner at the conclusion of each NFL fantasy season. They are also much larger than single-year trophies because they must have enough space to engrave several years worth of league champions. It's true, perpetual trophies are typically more expensive than single-year trophies. However, as I noted before, the yearly cost is actually quite low when spread across owners and multiple years. Perpetual trophies are some of the most awesome fantasy football trophies on the market. That's because they're huge, eye-catching, and similar to football championship trophies you see awarded in real football leagues like the NFL and NCAA College Football. 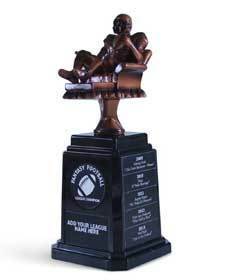 Is a perpetual fantasy trophy right for your league? Single year trophies for fantasy football leagues are generally much smaller than perpetual trophies. The champ also gets to keep the trophy. Is a yearly-awarded fantasy trophy right for your league? There is nothing to prevent your league from sharing a smaller, yearly trophy among your league champions. This is especially if your league doesn't charge a league entry fee (and you have no money to invest in prizes). The drawback is that some owners may lose the incentive to put their best foot forward. This doesn't have to be limited to perpetual fantasy trophies, however. Some single-year trophies also allow you to engrave some information, although space is normally quite limited. Does getting your perpetual league trophy engraved each and every year sound like a hassle? Instead of making this the job of the league commissioner, make the last-placed team responsible for purchasing a newly engraved championship plate each year. Below I examine my five favorite fantasy trophies for 2018. There are three perpetual trophies and two popular, yearly trophies for leagues looking for a cheap fantasy trophy option. 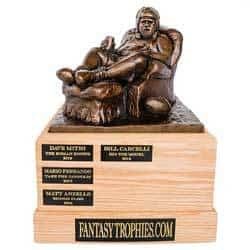 This perpetual trophy from SDL Awards Line offers most of the amenities of the Fantasy Trophies' Armchair trophy but at a much more affordable price. This trophy stands an impressive 16 inches tall, and the chrome football is actually life-size. The one thing I really like about this trophy is that you can customize it by engraving your league's logo onto the front of the trophy. No other trophy in this review supports this feature. If your league doesn't have a logo, no problem. You can choose from one of six stock fantasy football logos during the checkout process. Is your league a few years old? SDL will actually engrave three of your league's previous champions for free at the time of purchase. As an added bonus, they'll even toss in a fantasy football key-ring bottle opener to sweeten the pot. If you're looking for an awesome perpetual trophy with cool customization options, the SDL Chrome Perpetual could be the ideal fantasy football champion trophy for your league in 2018. This QB Perpetual trophy from Fantasy Jocks supports the engraving of 15 years worth of champions and stands over 12" tall. Fantasy Jocks is an established fantasy prize merchant with an extensive product line and stellar reputation. You can read my full Fantasy Jocks review here. This is a favorite perpetual trophy among fantasy commissioners because it is affordable and will likely be the last trophy you ever have to purchase for your league. Cheap perpetual fantasy football trophies (that are also high-quality) are almost non-existent. When you compare the perpetual trophies in this review, dollar for dollar, the QB Perpetual easily has the highest value. Although you can't engrave your league logo onto this trophy, they will engrave your four previous champions as part of your initial purchase. For moderately-funded leagues that like the idea of a perpetual trophy, this could be a great fit. There is an endless number of fantasy trophy vendors in the world. But this incredible trophy from Fantasy Trophies is the most unique fantasy football trophy I've come across. It doesn't take a genius to recognize that the Armchair Quarterback Perpetual Trophy is a creative work of art. It embodies what the sport of fantasy football is really about: being an armchair quarterback. This cool fantasy football trophy is made of a solid cast urethane compound. The bronze finish is hand-painted, meaning no two trophies are the same and you will indeed get a one-of-a-kind award from these guys. Compared to the other trophies in this review, the ArmChair Perpetual from Fantasy Trophies is definitely a luxury item. At last check, this trophy is priced on the high end at $375. But if you consider that this fantasy football winner trophy allows for the engraving of 36 years of champions, it makes a lot of sense for long-running leagues with expensive taste. If you love the idea of a custom-made trophy, but this trophy it outside of your price range, don't' fret. Fantasy Trophies offers several other hand-crafted trophies on their website that are just as stunning, but a bit more affordable. I dig this NFL fantasy trophy from Fantasy Jocks because it just looks ridiculous. But after all, we are playing a silly game. It's also an accurate reflection of what a fantasy owner feels like as he wins a fantasy football championship- a beast! This single-year trophy has the benefit of sporting an engraving plate. This way you can customize it each year before presenting it to your league champ. It's a nice touch and is free with your purchase of the item. Fantasy football owners rave about the Beast Trophy, and it's very popular among leagues that present yearly trophies. It's also a cheap fantasy football trophy compared to the other trophies in this review. If you don't like this award for any reason, Fantasy Jocks has a no questions asked return policy. You can rest assured you'll be happy with your purchase or you'll get your money back. This trophy from Decade Awards is an excellent option for leagues that choose to present a trophy to the league champion each and every year. Standing 9.5 inches tall, it's a considerable size for the price. Compared to many other budget trophies on the market, it just looks much nicer. A versatile feature of this trophy is that you can attach it to one of Decade Award's perpetual bases if you want to dress it up or convert it to a multi-year trophy. If you check out this trophy's reviews, you'll see that their customer service is very responsive and can help you out if you decide to go this route. One drawback of these smaller trophies is that many just don't have customization options. For instance, you can't swap out the logo on this trophy or engrave any league champions. But for the price, this is a fantastic yearly trophy. My pick for the best 2018 fantasy football championship trophy is the Chrome Perpetual trophy from SDL Awards. I feel like if you're going to splurge for an impressive perpetual trophy, then you should go for the most amazing championship trophy on the market. The fact that this trophy can record up to 24 league champs means it could easily be the first and only championship trophy your league ever have to buy. Considering they will engrave your league logo and up to three previous league champions for free and it's easy to see why this is my pick for the best fantasy football trophy of 2018.